Washington, February 18, 2010 /PN - NASA/ A diverse cast of cosmic characters is showcased in the first survey images NASA released Wednesday from its Wide-field Infrared Survey Explorer, or WISE. Since WISE began its scan of the entire sky in infrared light on Jan. 14, the space telescope has beamed back more than a quarter of a million raw, infrared images. Four new, processed pictures illustrate a sampling of the mission's targets -- a wispy comet, a bursting star-forming cloud, the grand Andromeda galaxy and a faraway cluster of hundreds of galaxies. "All these pictures tell a story about our dusty origins and destiny," said Peter Eisenhardt, the WISE project scientist at NASA's Jet Propulsion Laboratory in Pasadena, Calif. "WISE sees dusty comets and rocky asteroids tracing the formation and evolution of our solar system. We can map thousands of forming and dying solar systems across our entire galaxy. We can see patterns of star formation across other galaxies, and waves of star-bursting galaxies in clusters millions of light years away." 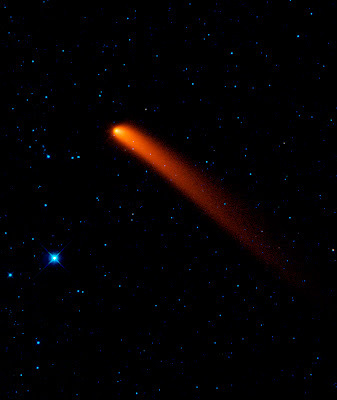 Comet Siding Spring appears to streak across the sky like a superhero in this new infrared image from NASA's Wide-field Infrared Survey Explorer, or WISE. The comet, also known as C/2007 Q3, was discovered in 2007 by observers in Australia. The snowball-like mass of ice and dust spent billions of years orbiting in the deep freeze of the Oort Cloud, a spherical cloud of comets surrounding our solar system. At some point, it got knocked out of this orbit and onto a course that brings it closer to the sun. On October 7, 2009, it passed as close as 1.2 astronomical units from Earth and 2.25 astronomical units from the sun (an astronomical unit is the distance between the sun and Earth). Now, the comet is leaving the warmer, more hospitable neighborhood of the solar system and heading back out to chillier parts. In this view, longer wavelengths of infrared light are red and shorter wavelengths are blue. The comet appears red because it is more than ten times colder than the surrounding stars, for example, the bright blue star in the foreground. Colder objects give off more of their light at longer wavelengths. An ice cube, for example, pours out a larger fraction of its light at longer infrared wavelengths than a cup of hot tea emits. A comet like this one can be thought of as a time capsule leftover from the formation of our solar system 4.5 billion years ago. After spending most of its long, lonely life in the darkest, coldest parts of our solar system, it warms up as it approaches the sun. The sunlight causes it to shed ices and dust in a long tail that trails behind it. Comet Siding Spring, having experienced this "spring" awakening, is glowing in infrared light that WISE can see. Once it moves too far from the sun's warmth and light, it will disappear from view for the foreseeable future. Astronomers will use these measurements to learn about the comet's size, composition, reflectivity, and the size and makeup of the dust particles in its coma (the hazy cloud surrounding its nucleus) and its tail. WISE data on this and other comets will help unlock clues that lay within these icy time capsules, teaching us about our solar system's evolution. In this image, 3.4-micron light is colored blue; 4.6-micron light is green; 12-micron light is orange; and 22-micron light is red. It was taken on Jan. 10, 2010. The immense Andromeda galaxy, also known as Messier 31 or simply M31, is captured in full in this new image from NASA's Wide-field Infrared Survey Explorer, or WISE. The mosaic covers an area equivalent to more than 100 full moons, or five degrees across the sky. WISE used all four of its infrared detectors to capture this picture (3.4- and 4.6-micron light is colored blue; 12-micron light is green; and 22-micron light is red). 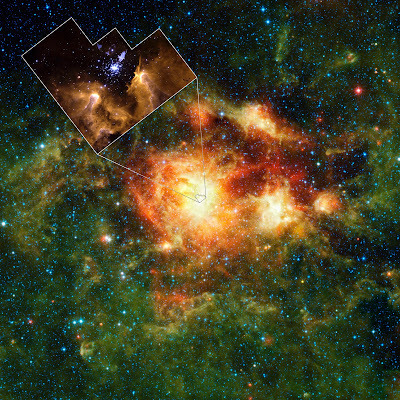 Blue highlights mature stars, while yellow and red show dust heated by newborn, massive stars. Andromeda is the closest large galaxy to our Milky Way galaxy, and is located 2.5 million light-years from our sun. It is close enough for telescopes to spy the details of its ringed arms of new stars and hazy blue backbone of older stars. Also seen in the mosaic are two satellite galaxies, known as M32, located just a bit above Andromeda to the left of center, and the fuzzy blue M110, located below the center of the great spiral arms. These satellites are the largest of several that are gravitationally bound to Andromeda. The Andromeda galaxy is larger than our Milky Way and contains more stars, but the Milky Way is thought to perhaps have more mass due to its larger proportion of a mysterious substance called dark matter. Both galaxies belong to our so-called Local Group, a collection of more than 50 galaxies, most of which are tiny dwarf systems. In its quest to map the whole sky, WISE will capture the entire Local Group. This image from NASA's Wide-field Infrared Survey Explorer, or WISE, highlights the Andromeda galaxy's older stellar population in blue. It was taken by the shortest-wavelength camera on WISE, which detects infrared light of 3.4 microns. A pronounced warp in the disk of the galaxy, the aftermath of a collision with another galaxy, can be clearly seen in the spiral arm to the upper left side of the galaxy. 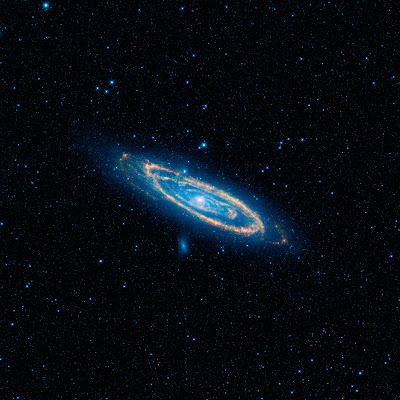 This image from NASA's Wide-field Infrared Survey Explorer, or WISE, highlights the dust that speckles the Andromeda galaxy's spiral arms. It shows light seen by the longest-wavelength infrared detectors on WISE (12-micron light has been color coded orange, and 22-micron light, red). The hot dust, which is being heated by newborn stars, traces the spidery arms all the way to the center of the galaxy. Telltale signs of young stars can also be seen in the centers of Andromeda's smaller companion galaxies, M32 and M110. 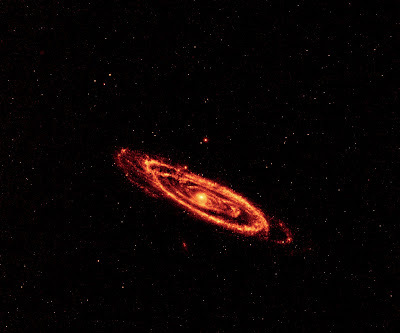 Andromeda, also called M31, is 2.5 million light-years away, and is the nearest large neighbor to our Milky Way galaxy. This image of a dense cluster of galaxies was captured by NASA's Wide-field Infrared Survey Explorer, or WISE. The cluster, called Fornax because of its location in a constellation of the same name, is 60 million light-years from Earth, and is one of the closest galaxy clusters to the Milky Way. Clusters are large families of galaxies that are gravitationally bound together, containing enough matter to pull even distant galaxies toward them. WISE's large field of view and multi-wavelength infrared sight allowed it to form this complete view of the cluster, containing dozens of bright galaxies and hundreds of smaller ones. Old stars show up at the shorter infrared wavelengths, color coded blue. Dust heated by new generations of stars lights up at longer infrared wavelengths, colored red here. 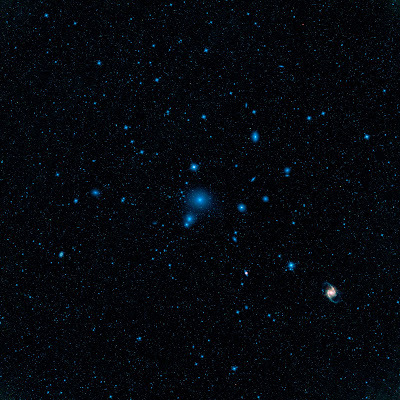 The center of the cluster is dominated by the galaxy known as NGC 1399, a large spheroidal galaxy whose light is almost exclusively from old stars and thus appears blue. The most spectacular member of Fornax is the galaxy known as NGC 1365, a giant barred spiral galaxy, located in the lower right of the mosaic. Against a backdrop of blue light from old stars, the dusty spiral arms in NGC 1365 stand out. The arms contain younger stars that are heating up their dust-enshrouded birth clouds, causing them to glow at longer infrared wavelengths. This galaxy is one of only a few in the Fornax cluster where prolific star formation can be seen. WISE will search the sky out to distances of 10 billion light-years looking for the most luminous cousins of NGC 1365. In this image, 3.4- and 4.6-micron light is colored blue; 12-micron light is green; and 22-micron light is red.